شهابی, مریم, پرهیزگار, محمد مهدی, حسینی, میرزا حسن, جوکار, علی اکبر. (1397). طراحی مدل قابلیت های تجارت اجتماعی در سطح سازمان با توجه به نقش میانجی پذیرش شبکه های اجتماعی (مورد مطالعه: صنعت هتلداری). دو فصلنامه علمی-پژوهشی مدیریت اطلاعات, 4(2), 133-153. مریم شهابی; محمد مهدی پرهیزگار; میرزا حسن حسینی; علی اکبر جوکار. "طراحی مدل قابلیت های تجارت اجتماعی در سطح سازمان با توجه به نقش میانجی پذیرش شبکه های اجتماعی (مورد مطالعه: صنعت هتلداری)". دو فصلنامه علمی-پژوهشی مدیریت اطلاعات, 4, 2, 1397, 133-153. شهابی, مریم, پرهیزگار, محمد مهدی, حسینی, میرزا حسن, جوکار, علی اکبر. (1397). 'طراحی مدل قابلیت های تجارت اجتماعی در سطح سازمان با توجه به نقش میانجی پذیرش شبکه های اجتماعی (مورد مطالعه: صنعت هتلداری)', دو فصلنامه علمی-پژوهشی مدیریت اطلاعات, 4(2), pp. 133-153. شهابی, مریم, پرهیزگار, محمد مهدی, حسینی, میرزا حسن, جوکار, علی اکبر. طراحی مدل قابلیت های تجارت اجتماعی در سطح سازمان با توجه به نقش میانجی پذیرش شبکه های اجتماعی (مورد مطالعه: صنعت هتلداری). 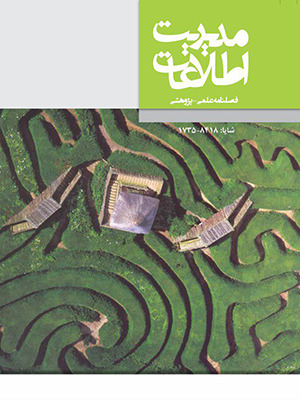 دو فصلنامه علمی-پژوهشی مدیریت اطلاعات, 1397; 4(2): 133-153. The purpose of current research was to investigate the most importance organizational elements and operational change for networks acceptance considering to social commerce capabilities in organizational level. The combination approach, therefore, was used. Firstly, the Delphi method was used to determine the most importance of effective elements on social networks acceptance; secondly, the electronic commerce and marketing was used via a number of 32 expertise and Staffs University in information technology area. Based on Delphi results, it was designed the proposal model for social networks acceptance, it then was assessed experimentally via using CVI and CVR criteria after confirming the validity of questionnaire content. Experimental data was collected from 385 subjects including active hotel managers and staffs in social networking via simple random method. Based on results, the operational change elements as well as organizational elements have affected positively on social networks acceptance and social commerce capabilities and social networks acceptance also would lead to amplify the social commerce capabilities at organizational level. The results showed the operational change has more effective than organizational level in social networks acceptance.